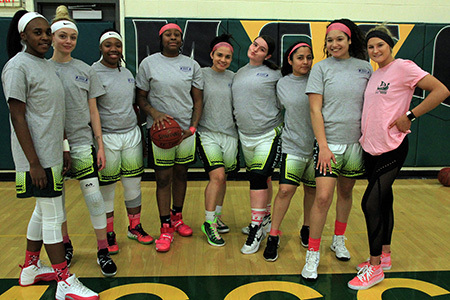 West Windsor, N.J. – – It was a total team effort for breast cancer awareness at Mercer County Community College (MCCC) on Jan. 31. For the ninth consecutive year, the Athletics Department and Mercer’s chapter of the American Association for Women in Community Colleges (AAWCC) co-hosted “Think Pink for Breast Cancer Awareness Night,” a fundraiser to benefit the Breast Cancer Resource Center (BCRC) of the YWCA Princeton. A community of Vikings fans came out to support the event, which raised over $1,000, almost doubling last year’s total. All proceeds will be donated to BCRC, which provides support to breast cancer patients and their families during and following treatment. The event was held during women’s and men’s basketball games in the West Windsor Campus gymnasium. It featured a lobby display staffed by Fro Andronikou, BCRC's outreach and education coordinator, plus tables filled with more than 30 raffle prizes donated by individuals and area businesses. In the “Think Pink” spirit, Vikings players donned pink shoelaces, headbands, and t-shirts, and coaches wore pink shirts and in one case – thank you, Assistant Coach for Men's Basketball Stan Tuchez! – a hot pink suit. The Vikings provided some exciting action on the court, as the women defeated Rowan @ Gloucester 76-67, marking Head Coach Mike Tenaglia’s 400th win. The men’s team lost a close game to Gloucester 86-82. 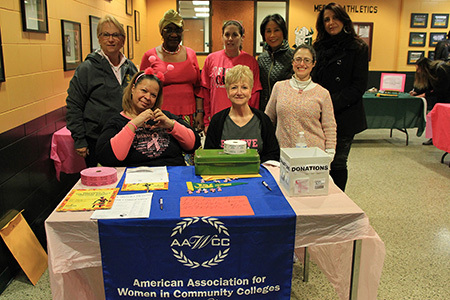 In addition to participation by student athletes, AAWCC volunteers greeted fans at the door, selling raffle tickets and tickets to the games. The Athletics staff sold pink t-shirts, which added to the fundraising total. The gym was a sea of pink. On the far wall were a series of posters paying tribute to survivors of breast cancer, patients who are currently fighting the disease, and those who have lost their battle. All are known and loved by MCCC players, coaches and staff members. 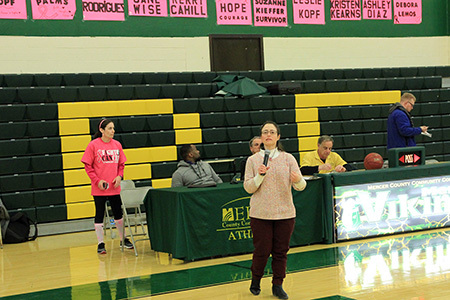 WWFM's Rachel Katz spoke at halftime of the women’s game, recounting her personal battle with breast cancer. She noted that after her diagnosis at the age of 42, BCRC became a go-to resource during her treatment and its aftermath. Cahill-Wetzel observes that the event also sends an important message of support to patients and their families. "We want people to know that they are not alone when they are diagnosed with breast cancer. Participation by our student athletes raises their awareness and provides them with an opporutnity to give back to their community," she said. Thanks to all AAWCC volunteers and individuals who donated to the fundraising total and to the businesses that stepped up to donate raffle prizes, including DeLorenzo's Tomato Pies, Porfirio's Italian Market & Cafe, Caesar's Bagels & Deli, Carella's Hallmark, Kalinowski Performance Academy, LuLaRoe Ashley Moffett and Princeton University Athletics. The women's basketball team was all in to support the Breast Cancer Resource Center- YWCA Princeton. "Think Pink" volunteers, seated from left, Stephanie Williams and Barbara Pieslak; back row from left, Lisa Camillone, Lucia Brown-Joseph, Erin Cahill-Wetzel, MCCC President Jianping Wang, BCRC representative Fro Andronikou and Rachel Katz, standing, front. Rachel Katz shared her own experience with breast cancer and the support she received through BCRC.